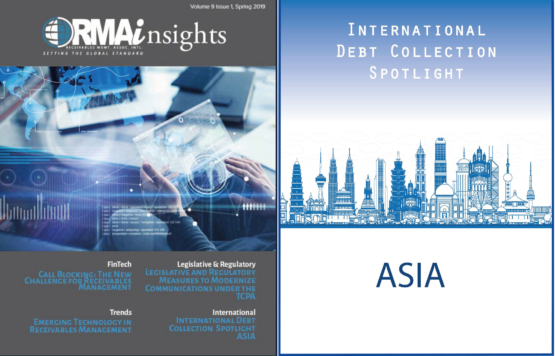 April 2019, – RMAi (Receivable Management Association international) published in its magazine the article of Kamil Knap, CFO-Asia of MBA Consult Group, “International debt collection spotlight. Asia”. Debt collection in Asia is getting more and more attractive. The enormous market of more than 4,5 billion people that are newly introduced to financial products have created unprecedented growth. Asia combined is now 40% of the North American market household credit limits with exponential growth. Building joint ventures with local partners face challenges due to cultural differences. the Asia receivables management market is in its infancy but growing quickly to bring additional value to both customers and originating creditors. Asia, as a market for debt collection and receivables management is getting very interesting due to few facts: Asia has a tremendous population. 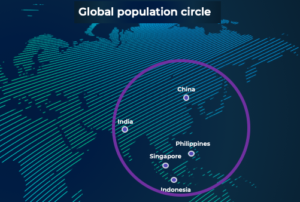 There are more people living inside the circle drawn on the map below, than outside that circle globally. The Asian market is gowing fast. The largest conributor of growth is the Chinese market that has already reached over 33% of American market. 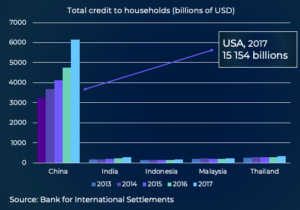 In 2017, the total household credit in the Chinese market was just over 6,000 billion USD compared to 15,154 billion USD in the United States. 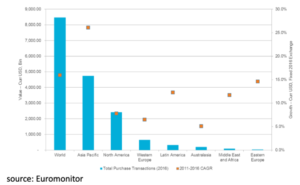 In terms of personal credit card transactions, the Asian market is already surpassing the North American market. According to the compound annual growth rate (CAGR), the Asian market has grown by over 3.5x the North American market from 2011 to 2016. Average interest rates on credit cards in Asia are significantly higher than in the United States. The Philippines has the highest average credit card interest rate at 42%. _e only country that was close to the United States average credit card interest rate (15.96%) was Malaysia at 15%. Business challenges can be minimized in Asia by following a few simple rules. First, it is important for joint venture partners to have international experience. Without the proper international perspectives – it is increasingly difficult to communicate and make accurate decisions. Second, understanding the socio-economic status of a prospective Asian partner is extremely important. Unfortunately, many middle level managers earn considerably less than their United States counterpart. Asia has a different standard of business than America. It is not customary to meet or do business at 5-star hotels, even if the pricing seems very attractive by American standards. Asian partners are also typically extremely adverse to change and seek structure. Third, use social media to find an advisor that will help translate and facilitate meetings with potential Asian partners. A native speaker will help avoid misunderstandings due to communication issues and cultural differences. In the end, it’s about relationships; whether in person, video chat or direct message. Countries with more developed markets such as, Singapore and Hong Kong, represent a tiny fraction of the Asian market. Most countries are old nations with tribes, villages and cultural differences that have internally diverse values and want to distinguish themselves from each other. Fortunately, social media, cell phones and the internet are slowly injecting technology into traditionally isolated cultures. Technology’s effect on culture has stimulated stability and growth in the region and increased demand for more sophisticated financial services products such as on-line purchasing and increased consumer lending. Asian consumers are typically less litigious than American consumers. Their connection to family and groups as a social dynamic leads to a preference to filing claims with regulators or local collection associations rather than pursuing legal action. Asian banks as well as established financial houses – are facing increased pressure on liquidity, as former underwriting models do not fully reflect changes in the market. Consumer lenders that started their operations 3-5 years ago look for collection companies with good reputations. Lenders look to build relationships with partners in the receivables management space that will not damage their name with regulators or use improper communication with consumers. Figure 5 represents different collection models and sources of influence I observe in Asia. Regions of Greater India, Thailand, Greater China and the South-Eastern region can be treated similarly and customers and regulators know each other very well. Where to start to build a business, returns and investments. 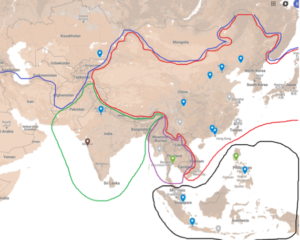 Currently the best place to incorporate and grow Asian operations is Singapore. Singapore allows money to easily flow in and out of the country. It has a very well established connection to all Asian countries and is English friendly. English is used on an everyday basis both in business settings and at home. All external business branches that the corporation operates can be linked to the Singapore headquarters in terms of cash-flow, tax and potential investment. Receivables management businesses usually become profitable within the first 18 months of operation with a proper expense structure. Challenges generally occur with service quality and controlling operational expenses more than revenue growth. Reasonable ROI is typically between 10-20%.